Newport is a 600-acre master-planned mixed-use community, consisting of retail, residential, office, leisure, and entertainment facilities. 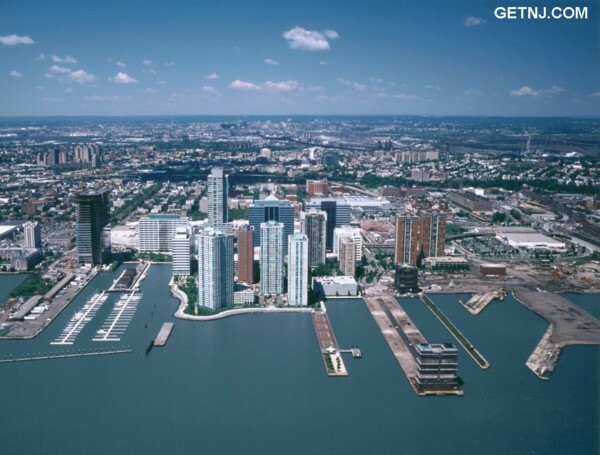 Located on Jersey City’s Hudson River waterfront, the new development is sited opposite Manhattan’s World Financial Center. Since construction began in early 1986, $1 billion has been invested, and more than 11 million square feet has been constructed at Newport. Already completed are the community’s infrastructure, including roads, bridges, and utilities (sewers, storm drains, water supply, gas, telephone, electric systems, and an electric power substation); Presidential Plaza -- four high-rise rental apartment buildings -- comprised of 1,504 units (100% occupied); a 443-unit condominium, the James Monroe (100% sold); a 1.2-million square foot regional shopping mall; four office buildings; parks and playgrounds; part of a six-mile river esplanade; a marina; and on-site parking for more than 13,000 vehicles. In September 1997 and August 1998 two new high-rise residential towers opened, respectively the Riverside (346 apartments) and the Atlantic (444 apartments). The East Hampton (441 apartments), opened in August 1999. The Southampton (409 apartments) opened in September 2000. Currently under construction is the 336-unit Pacific tower, to open in Autumn 2002. These five residential towers -- 1,976 apartments -- comprise a gated community called Towers of America. Also completed is Newport's 5 million square foot World Business Center office park, incorporating ultra-modern technology in state-of-the-art commercial towers to accommodate tenant needs. The first Newport office building in the office park was the 472,093 square foot, 14-story Newport Financial Center: Newport Office Center I. Located at the center of Newport and its many shopping and dining amenities, it is one of the top ten telecom buildings in the country, providing tenants with five separate fiber entrances; ten carrier switches, 40,000 square feet of collocation space and fully provisioned floors. Accessible to Newport's incomparable transportation network, the building -- like all of Newport's commercial space -- is leased to business firms and financial institutions seeking ultra-modern facilities near New York Harbor. The second office building, the 36-story, one million square foot Newport Tower (NOC II), is one of the tallest buildings in New Jersey. Tenants include The First Chicago Trust Company (Equiserve), USA Networks, and the Federal Deposit Insurance Corporation. The third office building, Newport Office Center III -- a 547,795 square foot, 14-story tower -- is known as the PaineWebber Building. Major tenants are PaineWebber, CIGNA, and U.S. Trust Co. The building opened in March 2000. The fourth office building is Newport Office Center IV -- an 860,835 square foot, 22-story office tower known as the Insurance Services Office Building. I.S.O. has leased 390,419 square feet for its international headquarters. Knight Securities also leased more than 266,000 square feet for its new world headquarters. Newport Office Center V is a 21-story, 780,000 square foot building; Newport Office Center VI is a 10-story, 345,000 square foot building. Both buildings -- totaling 1,200,000 square feet -- have been leased to JP Morgan Chase and Co. NOC V opened in January 2002. Occupancy for NOC VI commenced in July 2002. Construction on NOC VII -- a 32-story, 1.1 million square foot high-tech tower -- commenced in January 2001. Leased in its entirety to UBS PaineWebber, occupancy is scheduled for December 2002. Newport’s current World Business Center is comprised of 5 million square feet of office space, with state-of-the-art buildings providing the most technologically advanced communications, security, and power systems in the New York-New Jersey region. Newport Centre Mall is Hudson County’s only enclosed, regional shopping facility, containing two levels of retail stores, one level of food and entertainment, and a three-level parking garage than can accommodate 4,600 cars. The Mall -- and all Newport -- is accessible from Manhattan and throughout New Jersey via PATH, rail transit, local buses, and several major arterial thoroughfares. Newport Centre currently has more than 140 businesses, including three major department stores -- JC Penney, Sears, and Macy's -- specialty shops, a food court, and an 11-screen Cineplex Odeon movie theatre. In November of 1997 an International Food Mart opened, featuring a worldwide assortment of food and specialties, including Asian, Hispanic, and general supermarket merchandise, in a 137,000 square foot store located in the northern section of Newport. Newport Plaza is the community's 70,010-square foot "neighborhood" convenience shopping complex anchored by a 52,000-square foot Waldbaums/A&P. Also as part of Newport's intra-mural shopping network is the 40,000 square foot Modell's/Staples complex located near Newport Parkway and Washington Boulevard. Newport’s Swim and Fitness Center is comprised of an Olympic-sized, climate-controlled swimming pool; sundecks; whirlpools; exercise equipment; sauna; and aerobics rooms. Adjacent to the Fitness Center is an outdoor tennis complex, with four lighted courts. Newport Marina provides accommodations and services for more than 285 boats and yachts, up to 200 feet in length. A Yacht Club and 500 more slips are scheduled for the future. Newport’s River School is the first child care center on the Jersey City waterfront. Lipton Child Care Services also provide facilities for corporate clients. Newport Cafe is a 200-seat restaurant, located at the Marina, serving lunch, dinner, and Sunday brunch. Its 100-seat outdoor patio facility also offers diners panoramic views of New York Harbor and the Manhattan Skyline; and its Cafe Crown room provides private catering amenities for more than 225-guests. More restaurants and pubs continue to open at Newport such as Komegashi-Too, Cosi, Liberty Grille, Café Spice, Starbucks, Dorrian's, Confucius, Bartucci's, El Toro, and the South City Grill. In November 2000, the 187-room Courtyard by Marriott Hotel opened on Washington Boulevard, with its own dining amenities, The Hudson Café; a swim and fitness center; and banquet and meeting rooms. Newport's mass transit system has been upgraded with a $25 million expansion and modernization of the community’s on-site PATH subway station renamed Pavonia-Newport. Trains run 24-hours daily to the Wall Street area and Penn Station in Manhattan, Hoboken train and ferry terminals, and Newark’s central business district. In addition, Newport is served by a number of bus lines serving Jersey City and neighboring municipalities. Moreover, a North/South Light Rail Service traverses the area - with a station in Newport - offering surface transportation to commuters from Hoboken to Bayonne, with convenient access to bus lines and PATH stations along the route. Newport is contiguous to the ingress-egress of the Holland Tunnel, Pulaski Skyway, New Jersey Turnpike, US Routes 1 and 9, and Interstate 78. Newark International Airport is 15 minutes away. On-site fiber optic and communications services for the development are provided by Newport Telecommunications, an internal telephone system; Liberty Cable, a cable television network; Verizon; MCI; Teleport of New York; and MFS Network. When completed, the $10 billion Newport community will provide housing for approximately 30,000 residents in 9,000 apartments, and have a six-mile Hudson Riverfront esplanade.